Palm pots from Indonesia. Made of palm wood which is hollowed out, sanded down and hand varnished. A beautiful indoor or outdoor decoration. Available in 3 sizes. This palm tree trunk pots will add tropical look to your home, garden, hotel, shop etc. Beautiful huge palm tree trunk pot. More info about this palm pots, read below. Palm tree wood pots. Palm pots and palm vases. Wooden planters made of palm tree trunk, hollowed out and fine sanded. Available in various sizes: 100cm, 150cm and 200cm high with around 70cm diameter (40inch, 60inch and 80inch high with 28inch diameter). Our palm planters available in rustic brown, dark and fine sanded finish (natural). Buy direct from the producer in Bali Indonesia. 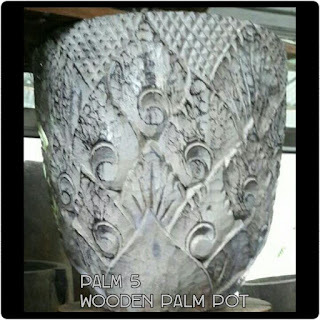 Palm Wooden Pot, enjoy competitive prices. We are confident these products will sell well in your country.